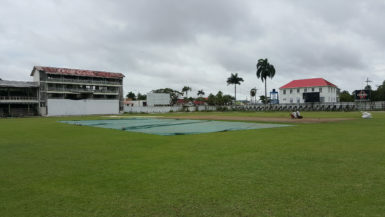 Rain washed out yesterday’s opening day in the final round of the Guyana Cricket Board (GCB)/Hand-In-Hand, three-day, Inter-county tournament. 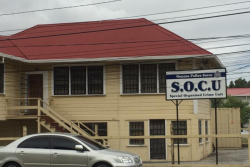 Leaders Demerara were set to face Essequibo at the Georgetown Cricket Club (GCC), Bourda. After some deliberation, the match was called off at 14:00hrs. Over at Wales, the U17 Select also had their encounter against the Keemo Paul-led Essequibo called off due to the inclement weather which affected some parts of the area. Once the weather permits, day two will bowl off at 9:30hrs and Demerara will look to continue their dominance, especially after openers Ronaldo Renee and Raymond Perez made history with their twin tons, 165*and 113 to put on 297 for the first wicket to help their team secure first innings points against Berbice in round two. Meanwhile, Essequibo will depend on the West Indies U19 vice-captain, Paul who picked up a few wickets and got a brutal 90-odd in the last round. They will rely on left-arm spinner Akini Adams who has been good with the ball. The U17’s have also shown good form, securing first innings honours over Essequibo in the previous match and will want their main men; Alphius Bookie, Ashmead Nedd, Joshua Persaud, Kurt Lovell and others to continue performing. Berbice who were crushed by Demerara at Everest a few days ago have not been playing badly but will need to improve dramatically on their bowling which let them down in round two. Their batsmen on the other hand, Joel Seitaram in particular, have been clicking as they showed their capabilities in terms of digging in when faced with huge totals.